If you're going to a red carpet event, you're going to need to wear the right type of red carpet clothing like fancy style dinner jackets by Tazio. These red carpet style blazers are all about getting noticed. 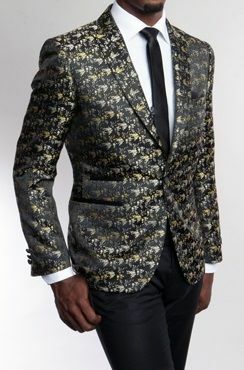 This fancy pattern black and gold slim fit blazer jacket has that red carpet that you can get your award wearing. It has double side vents in the back. Made of microfiber.